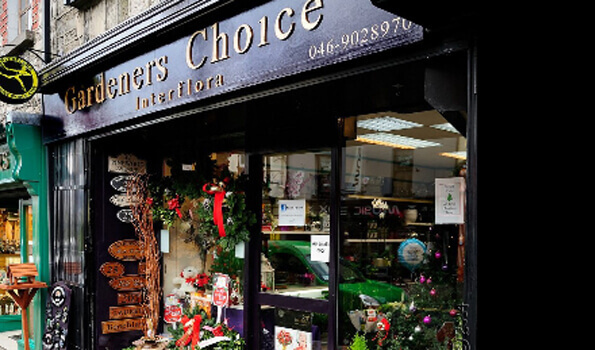 Navan Flowers is the online shop for Gardeners Choice. We are a family based business offering a professional and reliable service, hand delivering beautiful flowers in Navan, Co. Meath and surrounding areas. We can also send flowers to your family and friends Nationwide or Worldwide through the Interflora network. Our shop is located on Trimgate Street in Navan, Co. Meath. We stock a fabulous selection of fresh flowers, plants and gardening gifts. Handmade chocolates, teddies, vases, pottery and balloons can add a finishing touch to your gift. You may order on-line or by phone and pay by credit card over the phone. We accept payment on-line by Visa, Mastercard, 3V and American Express. In May 2017, Interflora awarded our shop with a 100% score based on quality of product and reliable service, the only shop to achieve this result on the island of Ireland . Please contact us with your special requests.